Thexder 95 is an excellent modern remake of the 1987 classic platformer. The general play mechanics are left untouched: you still pilot Thexder, a cool futuristic aircraft that can morph into a Japanese-style mecha, i.e. a giant robot, or a tank. This time your mission is to eliminate enemy "Techies" and their bosses in 10 worlds, with 5 levels each. Similar to other 2D platformers, you will need to collect energy cells, energy charges, charge extenders, weapons, and various other equipment. Depending on the difficulty level, the Techies will require a different number of hits to destroy. The more difficult levels require a very careful use of limited ammo, as well as strategic use of different weapons on different enemies. 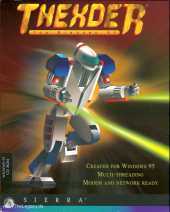 Fans of the original Thexder will be delighted by sharp SVGA graphics, excellent multiplayer support (modem, IPX, and TCP/IP), and a very good interface that lets you see the level map, enemy status, weapon selection, and available equipment at all times - via small display windows that surround the main screen. Digital speech and MIDI music are nicely done, although the cutscenes and animations could be much better. If you enjoyed the 1987 original and/or its sequel, you will have a lot of fun with this modern version. If you have never played the original, this version ranks as one of the better platformers you will come across. It is neither as fun nor as smooth as, say, Abuse, but it is still very enjoyable.